In 2008 I started my collaboration with the creative office “Animatic Vision” and the talented artist George Melissaropoulos (Meliss) known by his gag comics and distinctive style in animation. We created many commercials, websites, children's illustrations, animations, comics, cartoons and games on the internet . Animatic Vision also published the magazine “Happy Revolver”, and the comics "JUNGLY", "FLS" and " Xartinos Kosmos collector's edition". The team grew and many authors and artists participated in “animatic vision” like D.Kasdaglis , G.Komiotis , K.Foutsidis, K.Vamvasaki, J.Panoutsopoulos and many other artists . In 2009, we took our first steps into designing flash games on the Internet with great success. The pc game "meet merv" was a great hit at «GAMES EXPO 2012» ( University of Patras ) which was presented for the first time. 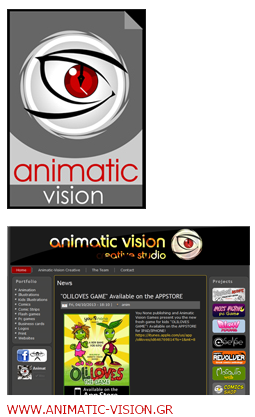 Animatic Vision currently creates games for PC, MAC, Mobile and produces 2d artwork, for outsourcing and in house projects.